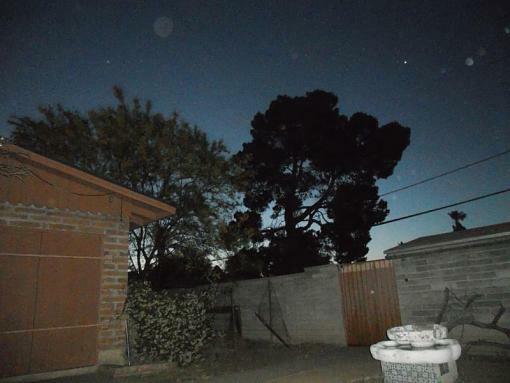 white spots on my photos - angels? Thread: white spots on my photos - angels? My friend took pictures of her 2 daughters and my daughter. All of the pics with her younger daughter and my daughter (but not her older one) have these mysterious white spots. The are varying in size and mostly transparent. She told me of a story about someone telling her they were angels watching over someone. 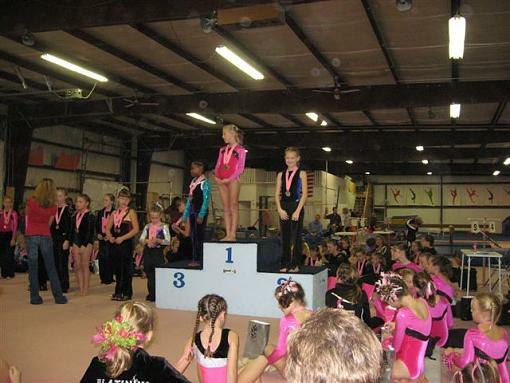 Her daughter was fighting a miserable cold that day and still performed very well at the meet. It was a cute story so we left it at that. But about a month later, I finally got around to looking at my pictures. I had the same spots in the pictures. So now I'm out to debunk the angel story (though I do smile at the thought). Here is as much detail as I can remember. It was indoors, low light. We both used automatic point and shoot settings and auto flash. I think we were probably too far for the flash to actually work though. We both took pictures of the awards stand (but different vantage points) so the basic setting (lighting and distance) was the same, only the girls on the award stand different. The pictures with my daughter also happened to have her younger daughter in the frame. The mystery spots did not happen in shots of her older daughter. The gym is actually a metal framed structure with insulation between the framework. As near I can tell, it was not a reflective surface. Any thoughts to what our "angels" are? Re: white spots on my photos - angels? Would have to see examples but probably some sort of reflection. Do you have any samples you could post? Since you're shooting at different vantage points, it sounds like its possibly lens flare. Just a rookie here and don't know how to post a photo. How do I get it on a URL? 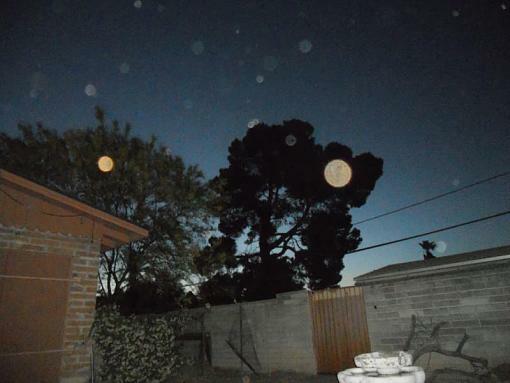 I looked at photos with lens flare, and they all seem to have the spots more geometric as if they are radiating from a light source. I suspect my bubbles are some how a result of a light source, but they are more random in size and opacity. to post a photo, use the Go Advanced feature, then click the paperclip which will bring up a window to browse your pics and upload. They won't appear in the message until you submit but they're there. Resize to 640 on longest first. I added the picture, but didn't know how to make sure it was max of 640. Hopefully, it will not allow me to upload unless it meets the criteria. The more I learn the more I realize I don't know. Look on the upperhalf of the photo. Almost looks like water spots. It looks like water spots, but no other pictures have those and my friend has the same spots with a different camera. I don't know, but the angel theory is looking more plausible. Haha. Spots of something, possibly dust, on the lens which are being lit up by something out of the picture. Possibly a bright light above you where light is just hitting the front of the lens. Unless you regularly clean the lens, it can come as a surprise when light like this reveals how much muck there is on the lens. Quite often shows up with flash reflecting from something bright outside the photo, really bad with some kids' clothes that have reflective bands in them to keep them safe from cars at night. I wonder if the girls have small reflective pieces on their leotards, and it's coming from your flash reflected off those? I doubt if your friend has the same spots in exactly the same place. But if they were standing near you photographing the same thing, probably something similar. If they were photographing the same kind of things as you, in the same environment (dusty, or with spray) in roughly the same place, then you might have the same muck on the lens. It would be interesting to see their photograph of the same scene. I have a few sets of photos dealing with these white spots. I myself tend to believe the "orb" explanation. As I take the photo and then retake it within 30 seconds only to see a total different photo. NO MOVEMENT, no angle change, just photo change. I have many as I said. I will try and post them to see what others feel. I see an angle change in those two images, the camera has been moved slightly between the images. Hi ... no your right. There was a movement difference in these pictures, but what I don't understand is why such a difference? I mean I was standing there at the same spot. In fact the first photo I took was just to show the tree's to my mom, but then I could not see clearly on the small screen so I just took the next one in case it would look clearer then the first. I did not even realize that there were spots until I put it up on the computer. There is nothing there to reflect off of, and can see no reason for so much more dust in less then 30 sec. if in fact that is dust? Oh yes it looks like dust, but it has to be lit at just the right angle to show up. So changing the angle of the camera is likely to illuminate different bits of dust. If there is dust blowing about in the air front of the lens, then if you use flash it will light up different dust in different photos. it doesn't have to be on your lens, just close to it.